Love Online, Is It Real Love or Are you Wasting Your Time. Is It Real Love or Are you Wasting Your Time? With all the online dating that goes on today, it is difficult to say who is serious and who is just playing with your emotions and wasting your time. Many become victims of false love online, believing they have finally found someone special who truly understands them and sees them in a way no one was ever able to see them before, only find out that they were being toyed with emotionally, taken advantage of and used. Finding Love online is not impossible and there are many success stories out there, but like all dating, it does not come without its risks and challenges. If you are prepared and understand the world of online dating, you can find a real meaningful loving relationship. To receive advice on love. So why exactly is dating online so alluring? 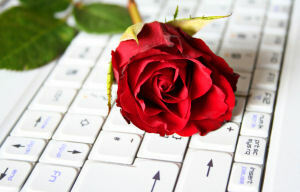 Though the reasons vary for everyone, majority of people tend to find themselves looking for love online because it is mysterious and allows them to really be in touch with their fantasies, as well making it possible (at least for a short while) make all their romantic dreams come true. When you first meet a person online, you can create this whole character of what the other person is like, whether they really are like that or not. You can create this whole romantic situation that you normally would not find outside on the social scene with other people around. Meeting someone online is like a small private romantic world you create for yourself and this is one of the main reasons people feel so seduced by the whole net-dating idea. However, many often get carried away creating a fantasy world and set themselves up for love fraud- ending up being used or stringed along, leaving them deeply hurt and angry. 1. The person you met online hesitates to give you a picture of him or her after a reasonable period of time. 3. He or She never makes an effort to actually commit to a date and see you in person: If they keep making excuses as to why they cannot see you in person, then something is wrong. Sure, there are reasonable excuses at times, but if this person truly wants a chance with you, then he/she will not blow off every opportunity to see you. 2. Stops browsing the dating sites for other people after meeting you: If you are looking for serious love and the person claims to really like you and is truly interested in forming a relationship with you, then he/she will no longer feel the need to explore "other fish in the sea". 3. One more major thing you must always remember to stay in touch with is your instincts. Many people ignore their instincts, telling themselves that they are just being paranoid or picky- they rather ignore red flags instead of face the truth because they so want to believe that they have found true love. Do yourself a favor and trust that inner voice inside you- your best friend who will never lie to you. Do not lower your standards and never settle for less out of fear of being alone. If you need advice on finding a fulfilling relationship or improving a relationship to a more fulfilling one, sign up for an e-session here.